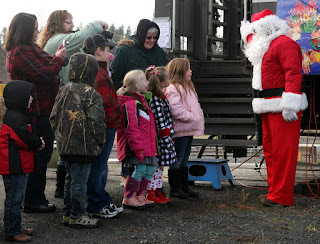 The previous post forgot to mention a big thank you to "Santa" for taking time out of his busy schedule to visit us in Potlatch. It was a labor of love, and we appreciate that we rated so highly. The pictures posted here are courtesy of Bob Behal, who promises that he has lots more photos of the day. These show Santa close up, and also a look from above, probably a reindeer shot, right? Take a bow, Potlatch, and HPG members. It was a good day. And special thanks to Ron Minden!!!! 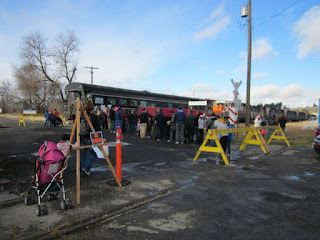 Things were jumping in Potlatch Saturday, and the HPG was in the thick of things after decorating the observation car on loan from the W&I Railway AND arranging for Santa to arrive in town by train (Thank you Stan Patterson and Karl Nelson). 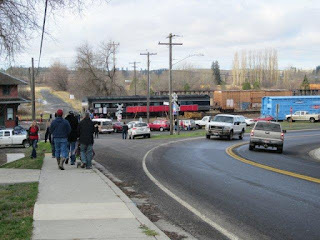 In the old company town days, bringing Santa in by train was traditional, and Don Somers got it in his head that things should happen that way again. 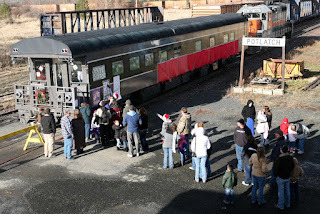 Thanks to the railroad, an engine was ready and waiting to haul the Merry Old Gentleman in, as hundreds of children and parents waited in the cold. Thankfully the sun was shining, and people laughed and visited as the big moment arrived. Leading up to Santa's arrival, a special obeservation car had been cleaned and decorated, with a red velvet chair, Christmas tree and all kinds of decorations setting the mood. Luckily, most attending Saturday's event will never know the amount of work that went into spray painting and covering over some harsh language someone had maliciously scrawled on the car prior to its arrival in town. The blustery weather made cleaning, decorating and hanging lights a tough chore, but by Saturday, things were ready. Meanwhile, the HPG had also coordinated some 30 vendors, so there were Santa workshops all over town. Many thanks to Kenny Cada, Karen Rohn and others for spearheading the four locations. As the overseer at the VFW site, I can attest to the wonderful array of vendors selling a variety of quality products. Pictured above is the booth belonging to HPG board member Webb French and his family who do business as Brush Creek Creamery. Their marinated feta is a hands-down favorite! 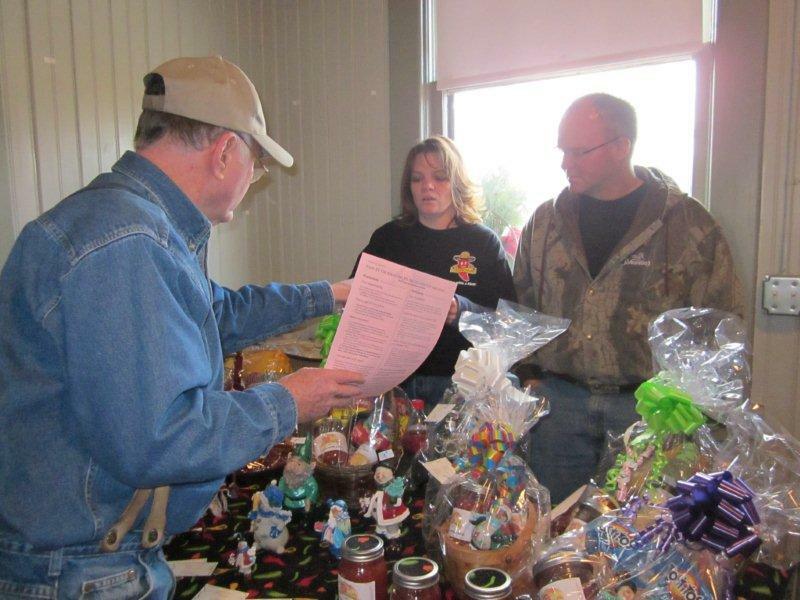 As people poured into the depot, VFW, Rebekah Hall and Cone Building, vendors such as our own HPG President Kenny Cada (pictured below) sold their creations to the hundreds of shoppers in town. Businesses and civic organizations also got into the act, as dog sled races, a breakfast with Santa, a concert and play also added to the excitement. 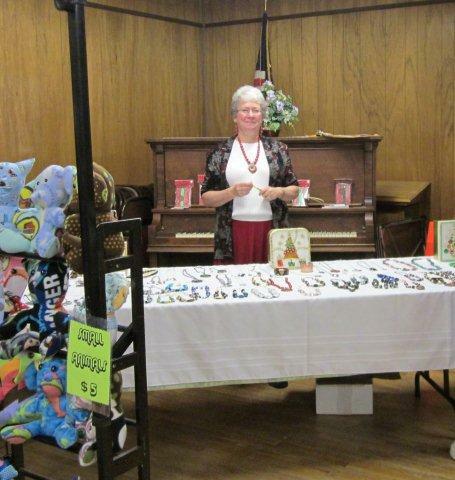 The Potlatch Historical Society did a brisk business in their new museum headquarters at City Hall, and 4-H members conducted a special sale allowing children to buy modestly priced gifts for their families. The grand finale, of course, was the lighted Christmas parade and huge fireworks demonstration, as the library hosted the Junior Jammers. Very special thanks to Mayor Dave Brown who got the whole event started 17 years ago! 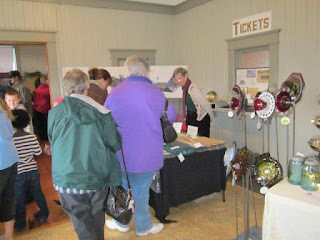 Bob Behal's wife, Carol, pictured below, set up shop in the depot, and many were interested in her wonderful textile creations. Meanwhile Bob was all over town, shooting pictures of the memorable day. Perhaps some of those photos will turn up in the next White Pine Quarterly. And then of course there was Don Somers in the thick of things, as always. No one will ever know the amount of hours he put into getting ready for the day, but let's just say his energy made you think the speeders would be arriving next!!! Thanks to all who made the Company Town Christmas a huge hit. And thank you David Johnson and Steve Hanks for the great writeup in the Lewiston Tribune. Rumor has it that Karen Rohn is already revved up for next year!!!! !